It’s the big day, and as guests arrive, budding memories unfold all around. Old friends catching up over a signature cocktail, new friends gathered around the guestbook. On your wedding day, every moment should toast to your love, and the menu is one of the main voices in that conversation. The menu is an opportunity to show off your personality as a couple. Decorative Treats You’ve matched your napkins to the bouquets, and the table cards are strategically placed, but there is something missing. Adding a simple decorative treat to your table settings invites your guests to get comfortable and excited for the spectacular meal ahead. Themes, Titles, Personality Every dish should match your desires, and the appetizers are no exception. Have a favorite dish from a first date? Are you both nature enthusiasts or avid travelers? Pulling your personality into the titles of your dishes is a fun and creative addition to your menu. Signature Couple’s Cocktail. Toast to your lifelong love with a cocktail tailored to your individual personalities. If you are both whiskey lovers, or maybe the bride prefers tequila, offer Bride and Groom signature cocktails. If you are expecting sober friends, offer a non-alcoholic version so everyone can indulge in the fun! Dietary Accommodations There’s no way around it, guests will arrive with dietary restrictions and picky children in tow. But we don’t want any guests feeling neglected or, gasp, hungry! To ease your worries, speak with us about all possible accommodations so that we can keep every guest happy and fed. Don’t forget Dessert! Whether you add a simpler cake for the kids, or offer a vegan/gluten free tart, offering an alternative dessert is just as important as the meal. As the big day approaches, we know you have an overwhelming list of to-do’s to tackle. Let us help! 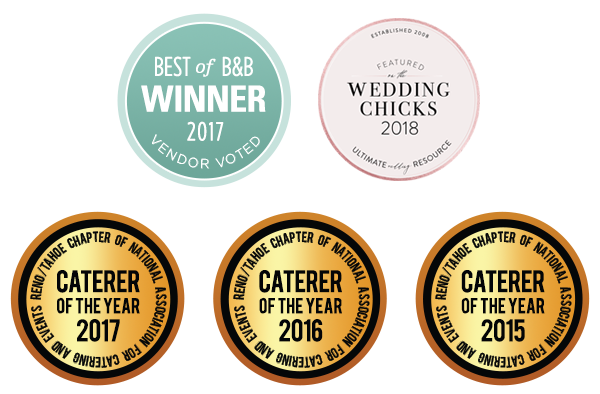 For wedding catering in Lake Tahoe and Reno, give us a call so we can get going on an unforgettable menu for your wedding day! While we prefer to customize a wedding menu for you, get a taste of our sample menus here!